"What if there was a place… where nothing was impossible?" Mondo has unveiled some stunning new art that they're selling in promotion for the upcoming release of Disney's Tomorrowland, directed by Brad Bird. The new art piece is 24" x 36" screen print designed by Kevin Tong (visit his website), and boy is it gorgeous. 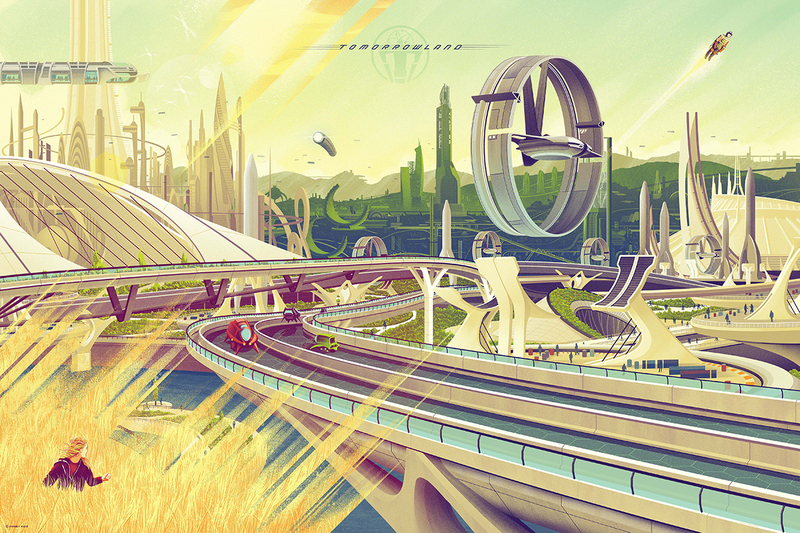 The art depicts Tomorrowland in the movie Tomorrowland, complete with transformation from the "real" world in the lower left featuring Casey Newton, played by Britt Robertson. Each of these will go so on sale on Friday, May 22nd when the film opens in theaters. And I'd say they are must have, especially if you're excited for this movie like we are. The variant version, in the evening it looks like, is my favorite one. Click either image to see them in full via IGN.com. Maybe it'll all make sense once we finally see the movie. View the featurette titled "Vision of Tomorrow". 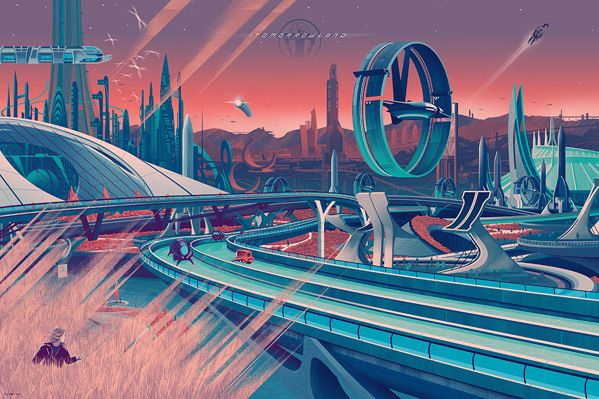 You can also still catch the other recent US trailer for Brad Bird's Tomorrowland right here. See the newest IMAX poster for the film here, and stay tuned for more. Tomorrowland is directed by Brad Bird (of The Incredibles, Ratatouille, Mission: Impossible - Ghost Protocol) who co-wrote the script with Damon Lindelof (Star Trek Into Darkness, Prometheus). Bound by a shared destiny, a bright, optimistic teen (Britt Robertson) bursting with scientific curiosity and a former boy-genius inventor (George Clooney) jaded by disillusionment embark on a danger-filled mission to unearth the secrets of an enigmatic place somewhere in time and space that exists in their collective memory as "Tomorrowland." Walt Disney Pictures releases the film everywhere on May 22nd this summer. Pretty good. I feel like it should have been a busier or simpler.